We love chorizo in our house, and there are some nice Whole30 approved chorizo options at our local grocery store. The brand is Logan’s and it is made here locally in Northern Virginia. I really like the flavor combination of ground beef and ground pork of some kind, and it really worked with the sweet potato in this recipe. In the notes section I have several ideas to modify to your liking. 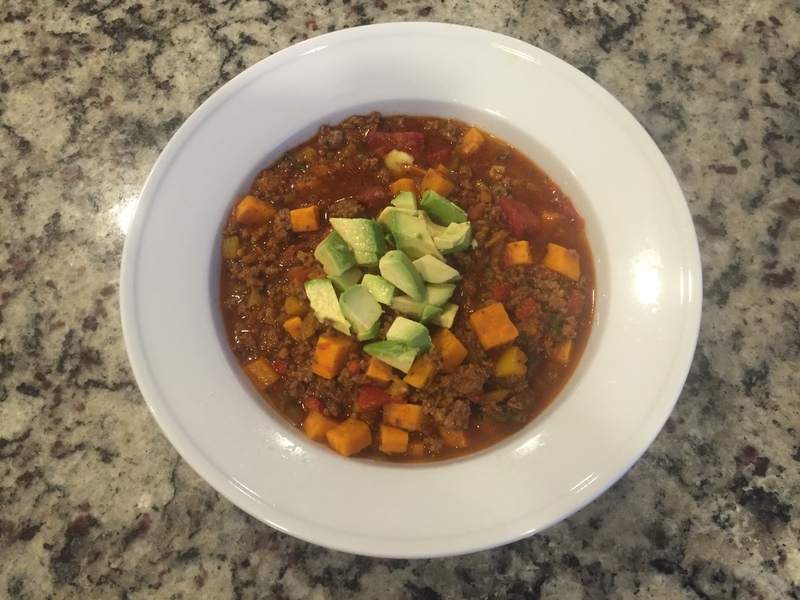 My husband actually did not prefer the sweet potatoes in the chili. I think he’s starting to burn out on them, which is not uncommon when we are eating stricter paleo or on Whole30. However, I LOVED it. So did my 1 year old. The small dice on the sweet potatoes is key. If they were in larger chunks I do not think I would have enjoyed it as much. I listed a few things as optional in the recipe, but I recommend you use the optional ingredients because they really make a difference. The little bit of coco powder truly adds a depth of flavor that is rich and satisfying. The addition of cilantro at the end gives it an herby freshness that I enjoy. And I always like to do a squeeze of fresh lime juice on soups and stews like this one. If we were eating cheese right now, a sprinkle of cotija would have been delicious! Let me know if you try it, and what you would change to make it better!